I wrote about a wonderful book called Going Places a few weeks. ago. It’s about a young girl who takes a go cart kit and builds something completely different. I love creative thinkers, kids and characters who have the courage to follow their hearts, even if it means doing something completely different from what others are doing. In this same spirit, I would like to introduce you to Marilyn, a young girl who is waiting and waiting for her monster to arrive. All the other children have already met their monsters…at the library, or the playground, on the way home from school or while riding their bikes. Monsters are fun. They become playmates and protectors. Monsters are great. Marilyn starts to become upset, even a little angry that her monster hasn’t arrived. Finally, Marilyn decides to break the rules. Instead of continuing to wait for her monster, as she is told she must, Marilyn strikes out to find her monster. Like any worthy adventurer, she brings peanut butter and banana sandwiches and juice. Marilyn looks everywhere. She calls out to her monster. Finally, she hears a faint sound. It’s her monster. He got lost and then stuck on his way to her. He was waiting for her to find him. Michelle Knudsen’s story makes you cheer for Marilyn and Matt Phelan’s illustrations will make you want a monster of your very own. This is a wonderful story, perfect for younger students. My students loved it. Wow did my students love this book! It’s a lot of fun, and the illustrations by Scott Magoon are great. 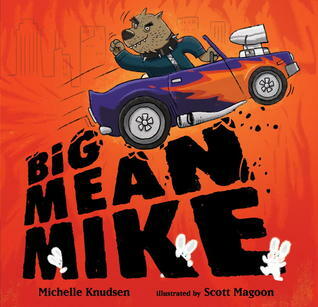 “Big Mean Mike was the biggest, toughest dog in the whole neighborhood.” He has the meanest looking car and really mean looking combat boots. When he opens his trunk to put in a package, there is a bunny – a really, really cute little bunny. Nothing is less big and mean than a really, really cute bunny. Big Mean Mike, puts it on the ground and drives away. The next day, the cute bunny is back with a friend. Big Mean Mike again leaves the bunnies on the sidewalk and drives away. This continues until the day that Big Mean Mike goes to the monster truck show. He then finds four really adorable bunnies under the driver’s seat of the car. He leaves them in the car to go into the truck show, but then just can’t leave those incredibly cute bunnies in the car. So, he sneaks them into the monster truck show. Eventually, he can’t resist their cuteness and lets them out of their bag to watch the show. As you might suspect, the other dogs tease him when they seem Big Mean Mike with four little bunnies. This is the best part of the book… The bunnies growl back at the dogs that are teasing Big Mean Mike. Then, Big Mean Mike tells those dogs that he can be friends with whomever he wants. This book is so great. I love the Big Mean Mike has a soft side and that he’ll stick up for himself when he does something that other dogs would be afraid to do. Go Big Mean Mike! Go Bunnies!